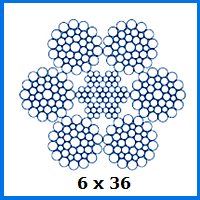 At over three centimetres in diameter, you would expect this edition of our 6×36 stainless steel wire rope to have a hefty load capacity. While this is certainly true, perhaps more impressive is the versatility afforded by the two different core options available for the 32mm 6×36 stainless steel wire rope. If the flexibility of a fibre core wire rope ticks the right boxes for you, then this is an appropriate product to procure. The 54,081 working load limit and 531kN breaking force should be ample, while the corrosion resistance of the metal will lessen the chance of moisture causing complications. If the improved strength of an independent steel wire core takes the top spot on your agenda, this is also on offer. In this instance the capacity rises to 58,342 tonnes, with a breaking force of 572kN. Meanwhile each rope has a high sheen exterior, meaning it is sure to impress on an aesthetic level while also being simple to maintain. Are there Alternatives to 32mm 6×36 stainless steel wire rope? When it comes to stainless steel rope in particular, or wire rope in general, you will be spoilt for choice when you shop with Rope Services Direct. We can supply galvanised rope, compacted rope, custom rope slings and a parade of tools and fittings to boot. Speak with a RSD representative on the phone by calling 01384 78004, or email our team direct with your question. We will be able to help, no matter the size or nature of your order. 32mm 6x36 Stainless Steel Wire Rope Overall rating: 5 out of 5 based on 6 reviews.